Cold water at the bottom of Lake Erie near Cleveland. Image: Mark Rowe. Warmer water contacting the bottom of Lake Erie near Cleveland. Image: Mark Rowe. Researchers are developing a system to warn Ohio water managers when unpalatable, harmful water from Lake Erie is headed their way. The project, with $1.5 million in federal funding, could give water treatment plant operators time to prepare to treat water that is hypoxic by predicting the movement of oxygen-depleted Lake Erie water. Hypoxia occurs when dissolved oxygen in a body of water is depleted to a level that is harmful to aquatic organisms. This is a particular problem in the central basin of Lake Erie, where it’s deeper. The water doesn’t mix all the away to the bottom during the summer. Two distinct layers, an upper one with more oxygen and a lower one with less oxygen, tend to form, said Craig Stow, a research scientist with NOAA’s Great Lakes Environmental Research Laboratory (GLERL) and co-leader of the project. Biological activity continues to happen in the lower layer, using up the oxygen without it getting replenished. There are numerous reasons why this is bad, for both humans and the environment. Lake Erie supplies drinking water to several million people. Many of the drinking water intakes along the southern central shore of Lake Erie draw in hypoxic water, Stow said. The chemistry of the water changes because of hypoxia and the water needs to be treated to prevent taste, odor and discoloration problems. That’s where this research project comes in. Stow and Mark Rowe, a research scientist with the University of Michigan Cooperative Institute for Limnology and Ecosystems Research, are developing a model that can predict when hypoxic water in Lake Erie will be heading near the water intakes. One of their collaborators is the City of Cleveland Division of Water, and Cleveland’s water intakes are where they will be focusing their research. “By having advanced warning of times when their water intakes may be affected by hypoxic water, these water systems will be able to better prepare for the changing conditions and be able to better insure a continuous supply of high quality drinking water to the public,” Rowe said. GLERL has sensors already out in the lake, but those sensors can only see the oxygen levels of Lake Erie’s central basin in real time. The model Stow and Rowe are developing would predict water movement in the lake, which is dependent on wind and weather conditions, to figure out when hypoxic water will draw near the water intakes. The nature of weather conditions and the inconsistent shape and depth of lakes mean that this model would have to be specific to Lake Erie. The project is working on a 5 year timeline. The 2-3 year range is when researchers hope to have enough data for an experimental model, Stow said. The hope is to have a working model that they can link to and use for predicting other physical and chemical developments in Lake Erie, Stow said. It would serve as a platform for developing another model that could predict phosphorus or nutrient levels after this 5-year project is completed. That further development would be important because excessive nutrient loading is also one of the reasons hypoxia happens. Excessive nutrients is also one of the causes of harmful algal blooms, which has also plagued Lake Erie and Ohio’s water systems. The algal blooms occur more on the western basin of Lake Erie, as opposed to the central basin where hypoxia mainly occurs. Just in 2014, the water in Toledo, Ohio, contained enough toxins from the algal blooms that a “Do Not Drink” advisory was issued by the City of Toledo. 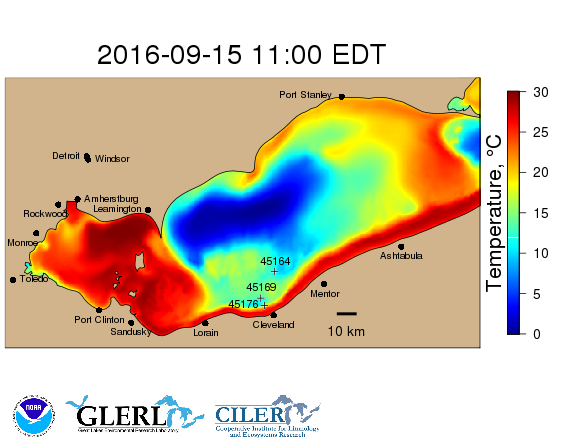 However, GLERL has also developed an experimental model, called the HAB Tracker, that has a similar purpose to this current project – it provides advance warning when the harmful algal blooms are near water intakes in western Lake Erie. During the algal bloom season, it provides a real-time tracking of the harmful algal blooms, but currently only shows a retrospective animation of the 2016 bloom pattern. This project is one of 10 coastal research projects across the U.S. that the National Centers for Coastal and Ocean Science has given a grant this year. These projects cover issues like harmful algal blooms, hypoxia and sea level rise.